A few days ago I commented on John Yau's attack on Eliot Weinberger's anthology American Poetry Since 1950: Innovators and Outsiders. Toward the end of that entry I mentioned that the review didn't have about it the left-right contentiousness of many other lit-crit squabbles of the day (late '80s/early 90s). Earlier here I wrote: "One might say that this fight is being waged at or for the heart of modernism's liberalism." Perhaps that's still accurate but waged should in any case have been italicized. Weinberger's letter speaks of the "embarrassed friends of John Yau" who urged him "not to reply to his bizarre attack" — and I had to wonder how many of these friends remained friends of Weinberger's when he went ahead and made his reply, which begins in a quite personal manner. Weinberger had thought he and Yau had been friends. "I went to his wedding," he notes. He offers his credentials of involvement with Chinese poetics and contrasts such experience with Yau's career-long incuriousness about poets of color or about such topics — or indeed about Chinese ("I spent years study Chinese — which John barely speaks and cannot read"). And: "My latest book is about Asia and Latin America. John's latest book is on Andy Warhol." "I will not dignify his scumbag race-baiting." 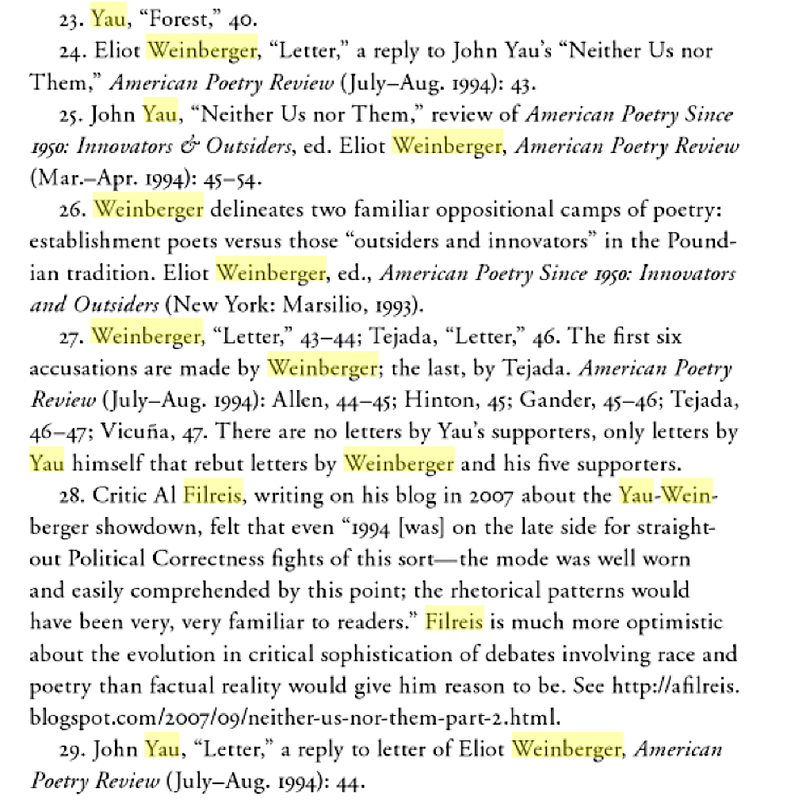 Yau's rejoinder is more temperate but really does little more than repeat the criticisms of the original review: Weinberger's anthology is racist and narrowly focuses on a poetics that is self-serving to the editor (disproportionate emphasis on poets associated with Sulfur and related projects). All these letters — W's and Y's but also those by defenders of W — really do seem to typify the PC/anti-PC fights of this era. Indeed, 1994 is on the late side for straight-out Political Correctness fights of this sort — the mode was well worn and easily comprehended by this point; the rhetorical patterns would have been very, very familiar to readers, so much so, I think, that the participants knew that witnesses to the contest would not need a scorecard to know the players, which is a perhaps too idiomatic (indirect) way of saying that the right-left terms of the debate about racism, sexism and literary-political multiculturalism did not need to be spelled out. Thus the larger ramifications of Yau's apparent attempt to use a left position to outflank the liberal-left Weinberger from his left did not need to be described for them to be operative. You can sense that this is a fight for the postmodern soul of Pound in Yau's original review-essay, but you can also see it in the July/August rejoinder. One of Yau's major complaints is that "Mr. Weinberger reduces the provocative wildness of the past fifty years of radical poetry to a tidy linear 'tradition.'" And that tradition is "Ezra Pound, passing through Charles Olson." Notice what Yau believes is lost in the ascendary of the Poundian mode as a late-20th-century critical apparatus: provocative wildness and radicalism. Yau doesn't mean "radicalism" as a matter for political poets (Edwin Rolfe, Tom McGrath, et alia), and his references to the non-avant-garde leftist poets left out of Weinberger's anthology seem disingenuous (he doesn't seem really interested in them even as he mentions them). And provocative wildness seems to be an attempt to make a category much wider than the already wide mode of poets working in the "cyclonic history" manner of Pound/Olson (Susan Howe is mentioned as such). Yau begrudges Amiri Baraka in this context. He would seek Amiri Baraka to support his case against Weinberger, but doesn't use him because "he is the only African American poet who can be directly connected to Charles Olson to emerge since 1960." My point is that as a skirmish in the Culture War none of this is interesting. As a fight for the heart of the Poundian, it's utterly fascinating. It's still all about Pound. * Note: the phrasing here is revised. It had read “...doesn't have a political bone in his body,” a bad and unfortunate idiom (and, when I was writing such bloggy posts, was alas typical of the hyperbole). John Yau himself has pointed out the implications of the idiom. I apologize; my wording should have enabled a reader's better focus on the issues in the Weinberger/Yau disagreement. The argument over the legacy of the Poundian mode is indeed a political one — not just "aesthetic."